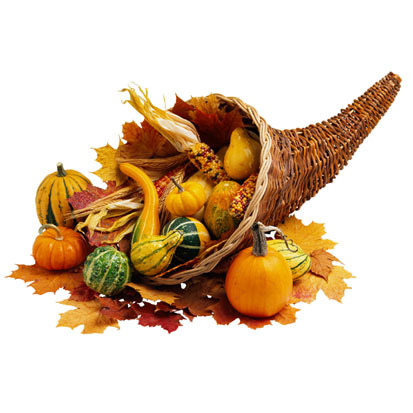 The cornucopia is an ancient symbol of harvest abundance. It is commonly represented as a woven spiral basket overflowing with fruit, grains, vegetables, and other agricultural products. In America it is one of the symbols of Thanksgiving time (second only to the magnificent turkey). The wicker basket stuffed with fruits has become such a familiar image, that it is easy to overlook the Greco-Roman roots of the horn of plenty. 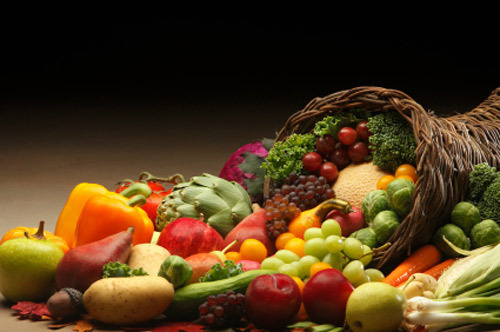 According to Greek legend, the cornucopia is the horn of Amalthea, the goat which served as foster mother to Zeus. In the benign version of the myth, young Zeus, unaware of his own strength, accidentally broke the horn off of the goat while he was playing with her. In the darker version, he slaughtered the goat when he reached manhood. From her hide he fashioned his impenetrable aegis. He gave her horn to the nymphs who had raised him, and this horn provided a magical eternal abundance of farm-raised food. In memory of her generosity, he set her image in the stars as the constellation Capricorn. There is yet another version of the cornucopia myth which Hercules broke the horn off of a river god and this became the original horn of plenty. Whatever its origin, the cornucopia remained a part of the classical pantheon. 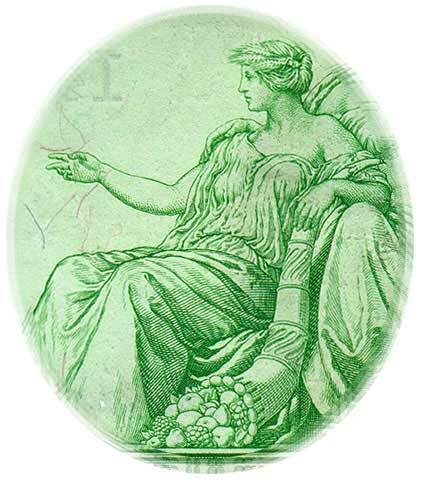 It is most frequently seen in the hands of Ceres/Demeter, the goddess of agriculture and grains. In Roman iconography the cornucopia was sometimes an attribute of Fortuna, the goddess of luck, and of the underworld god Pluto (who controlled the ground and thus was responsible for the gifts of the harvest). 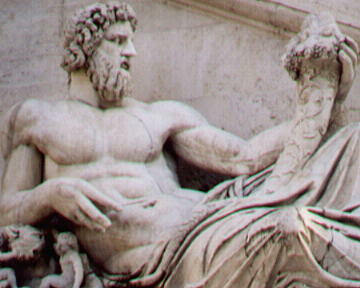 I like the Hercules/river-god myth because it reflects on how important water is to agriculture, but I greatly prefer the myth of Zeus and his foster-mother which seems to embody the moral quandaries (and the promise of civilization) which are inherent in agriculture. 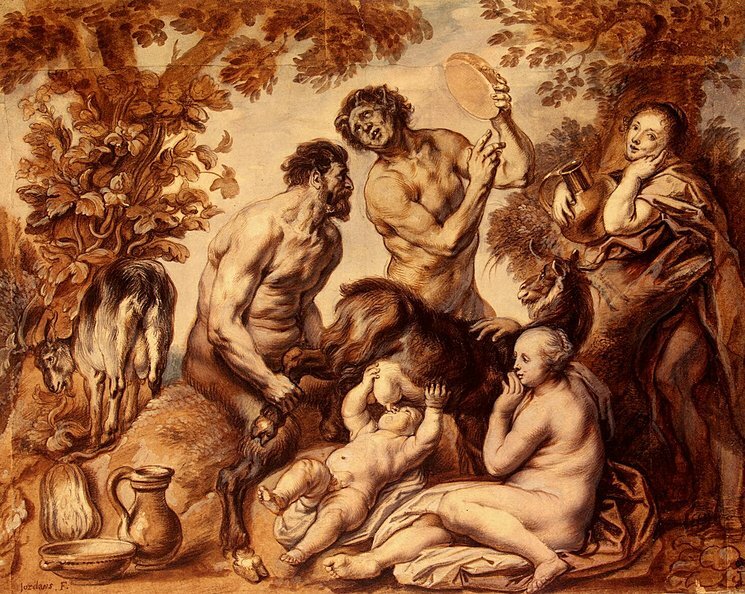 The story—like that of Cain and Abel–hints at the replacement of hunting with herding and farming (indeed goats were the original domesticated animal). Some cornucopias are now made of baked goods which makes the symbolic transition even more apparent. The horn of plenty is an admirable symbol of humankind’s fundamental dependency on agriculture–which lies at the root of our civilization and our prosperity. I am glad the cornucopia has kept its relevance for all of these thousands of years and has not been replaced by some tamer symbol. If anything is second to the turkey on thanksgiving, it’s either stuffing, cranberry sauce, or booze. Well that’s quite true. Who actually makes and eats a cornucopia? I guess I was writing about Thanksgiving traditions (although now that I think about it, even in terms of traditions, Americans might care more about football, binge-drinking, and shopping more than cornucopias). But as a Thanksgiving holiday decoration, cornucopias are right up there with turkeys, Mayflowers, puritans, Indian corn, and pumpkins…. Good point. I guess we are all always thinking about Venus shapes thanks to underlying life imperatives. I never liked Zeus/Jupiter that much. It’s bad enough that he drank milk from Amalthea. How disgusting of him. But for him to kill her and make her hide into a shield is worse. After all she did to him, that’s how he repaid her?! Something tells me that Cronus/ Saturn should have made him join his siblings. Agreed–he is a quite disturbing figure.